Marking 40 years since its famous UK cinema release, SATURDAY NIGHT FEVER is reimagined in a big new music and dance spectacular. Whilst paying homage to the 1977 John Travolta classic, this new stage version promises more drama, more music and hot new choreography, which is sure to have audiences on their feet and dancing the night away! 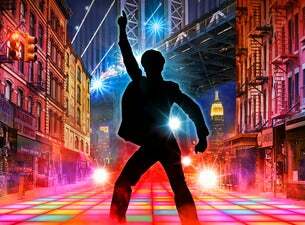 SATURDAY NIGHT FEVER tells the story of Tony Manero, and his reckless, yet thrilling road to dancing success. It features the Bee Gees greatest hits including Stayin’ Alive, How Deep Is Your Love, Night Fever, Tragedy and More Than a Woman as well as 70’s favorites Boogie Shoes, Disco Inferno and many more. Please note this show contains adult themes and strong language.